The Gulf Centre for Human Rights (GCHR) is an independent, non-profit NGO founded in 2011 to provide support and protection to human rights defenders (HRDs) in order to promote human rights, including but not limited to freedom of expression, association and peaceful assembly. It strives to document the environment for HRDs in the Gulf region and neighbouring countries, specifically Bahrain, Kuwait, Iran, Iraq, Jordan, Oman, Qatar, Saudi Arabia, Syria, the United Arab Emirates and Yemen, and is based in Lebanon. GCHR is a member of CIVICUS, FIDH, IFEX, and the Women Human Rights Defenders (WHRDs) International Coalition. Women’s rights and gender equality are at the core of GCHR’s work, and since 2011 GCHR has worked with women’s rights groups, women’s networks and individual women human rights defenders (WHRDs) in the Middle East and North Africa (MENA) region. GCHR has held several regular consultations with WHRDs from Saudi Arabia together with other women from the MENA region, either through formal or non-formal meetings, and the latest was early this year where we provided WHRDs with a forum to discuss their concerns and map the threats they face due to their work. 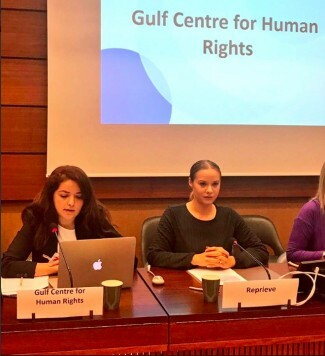 During the last UPR cycle, the situation of HRDs in Saudi has deteriorated, and WHRDs are particularly at imminent risk from their own state’s authorities. According to our recent report at least 30% of the total WHRDs cases documented by GCHR were from Saudi Arabia, affected by violations perpetrated by government institutions and discriminatory legal instruments. Background on the overall situation of W/HRDs in Saudi Arabia and particularly our concerns following the arrests of prominent WHRDs and activists since the beginning of 2018, despite international commitments. The state’s inability or unwillingness to comply and fulfil its commitment and obligations under Committee on the Elimination of Discrimination Against Women (CEDAW). The state’s restrictions on the freedom of association and assembly. The state’s continuous targeting of W/HRDs and activists for practicing their freedom of expression and demanding their fundamental rights.